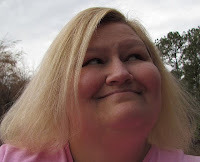 I was given the chance by My Blog Spark to try the new Simply cookies by Pillsbury. The great thing about these cookies is I didn't have to mix anything. All I had to do was put them in the pan and bake them. My family loved them! The cookies were nice and chewy. They were so good they were gone within a few minutes. What's wonderful about them is they have no trans fat, no high fructose corn syrup, no artificial colors, flavors, or preservatives. What they do have in them is flour, brown sugar, eggs, and vanilla. They also come in two great flavors. The kind we tried was chocolate chip, but they also come in peanut butter. Would you like to try them too? 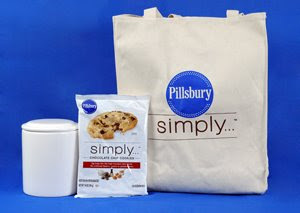 My Blog Spark is letting me give away a Pillsbury Simply Prize Pack which includes a coupon for a free pack of Simply cookies, a cookie jar, and a grocery tote bag. You can also print a coupon for Simply cookies here. For your first entry leave a comment on this post telling me what you do to simplify your cooking. Be sure to leave a separate comment for each entry you are doing. US residents only. Giveaway ends Tuesday August 4 at midnight. Once winner is announced, you will have 48 hours to get back to me with your address. I simplify my cooking by doubling up when I cook meat. Then I use the leftover for another dish. I simplify by making two of each meal's recipe, and freezing one meal for future use. The boys look pretty happy , posing while eating cookies. This giveaway is fantastic !!! The cookies do sound really good . I also collect cookie jars so I will be keeping my fingers crossed. OMGosh I thought these were some generic brand at the store so I've refused to buy them. haha. They need to they need to get the Pillsbury guy back on the bag. I know it by him. Sign me up please, I'd love to win this one. I follow your blog and on twitter!! I'd love to win this!! Speaking of Winning... YOU WON MY BOOK GIVE-AWAY!! with your address, and I'll get it out to you ASAP!! Crock pot cooking and menu planning are the ways I simplify. Love the photo of the boys enjoying your cookies! I've added myself to your following list though I already get your email updates. Simplify by using a crockpot for meals and not have to hurry up of an evening for meals. Thank you for the coupon !!!! And I KNOW that I follow you on twitter!